Sometimes we all need our own space. That’s a reality that even (or perhaps especially!) applies to the bathroom we share with our nearest and dearest. Alas, not many of us have the luxury of a bathroom to ourselves. But there are plenty of ways to create individual ‘his and hers’ areas within the room you have, no matter how small your space is. Double basin units are the obvious place to start. Not only do they add a luxe boutique hotel touch to your home, they are also super practical – no more bathroom squabbles over who gets to use the basin first! If you’re a fan of superb craftsmanship, our Marlborough collection of classically styled furniture now includes stunning new freestanding double basin units, in a standard or curved design, which can be finished in either a marble or solid surface worktop. The latter (new to the Marlborough range) adds a contemporary twist to the unit’s traditional lines, and replicates the natural beauty of stone at a more accessible price point, if your budget won’t stretch to marble. The Marlborough units are available in a trio of on-trend hand-painted finishes: Cobblestone, Cotton White and Charcoal. All three are versatile neutral shades that won’t date and suit both modern and retro designs. Neutrals are a great compromise for his and hers bathrooms where both parties have to be happy with the bathroom’s style and décor. Remember: not everyone is a fan of fuchsia and florals. Keep your room palette ‘clean’ and instead add a splash of colour and personality with towels and other accessories. Grey never goes out of fashion. If you’re both keen to keep things neutral, but perhaps add a little texture via subtle stripes, the Laura Ashley Sophie Dove Grey Towel is the perfect choice (and it’s also available in Blush and Seaspray). If you’ve a passion for patterns, treat yourself to Laura Ashley’s Wisteria Duck Egg towel instead. Separate basins are a great idea for his and hers bathrooms – but there are plenty of plus points about a tub built for two. If your space allows, a double ended bath is an excellent option, allowing you to lie back and relax together, without having to worry who has a tap sticking into their back! Our Fairfield double-ended roll top bath is inspired by a classic French design, and features gently sloping sides for a truly luxurious soak. A more modern option is our Opus freestanding bath, with soft curves and a lustrous acrylic finish. Untidy piles of products spilling over surfaces do not bode well for bathroom bliss – so you need to get your storage sorted. Our Marlborough Tall Boy coordinates perfectly with our new double basin units, and features open and concealed shelving to store all your lotions and potions. Or make the most of your wall space with our Marlborough Mirror Cabinet, which includes two internal shelves to keep your surfaces clutter-free – and your bathroom a harmonious his and hers haven. 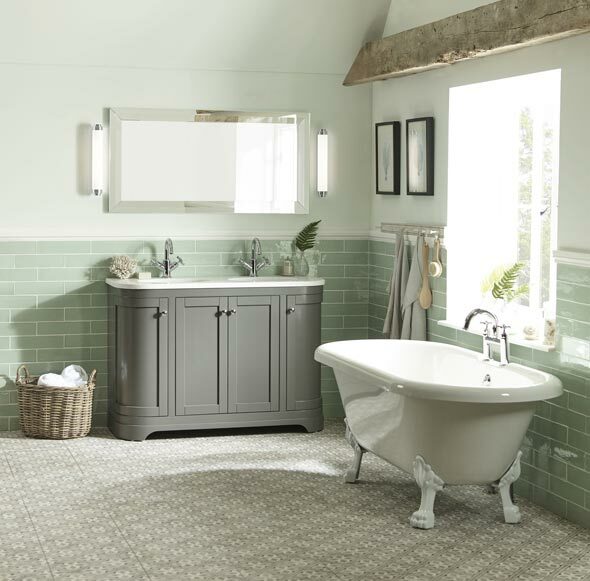 Visit our website, Facebook and Twitter pages for more bathroom inspiration and click here to find your nearest Laura Ashley Bathroom Collection retailer, who can help you create your dream bathroom. Copyright © 2019 Laura Ashley All rights reserved. 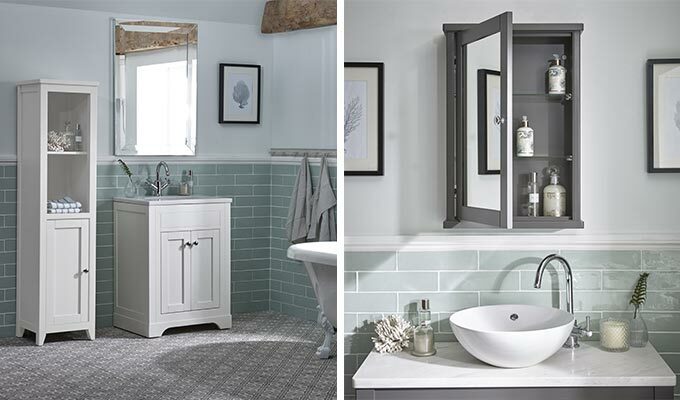 Laura Ashley Bathroom Collection is produced under license by Roper Rhodes Ltd.